This is my favorite outfit! I love it! Buongiorno Lilli, questo look sportivo ti dona molto. Il blu con il denim sono perfetti per l'estate e questo colori ti sta davvero molto bene. Ti auguro un sereno we. Ciao Lilli. Trovo molto carino questo outfit nei toni del blu. bel look, e bella la sciarpina con i motivi ad ancora, mi piace molto!! I am so in love with the blazer. I love what you did with the whole look, Lilli! Happy weekend, Love! la sciarpa è troppo carina!!!!!!!!!!!! Blue looks very nice on you! Great look, Lilli ;) I like your scarf. Happy friday you too <3, I love your casual look Lilli, I like your navy scarf, are so confortable those pants. Che bello questo blazer, taglio e colore splendido!!!! Mi piace troppo questo "navy" look con il tocco cool della sciarpa stampata! il blu, soprattutto in questa tonalità, è un colore che mi piace molto. La giacca è versatile , ne ho comprata una anch'io ma molto chiara quasi cammello. Bello l'insieme del look io ci metterò una super sciarla...le adoro!! Your look does have a really nice and relaxed holiday feel to it and you look so pretty in blue. 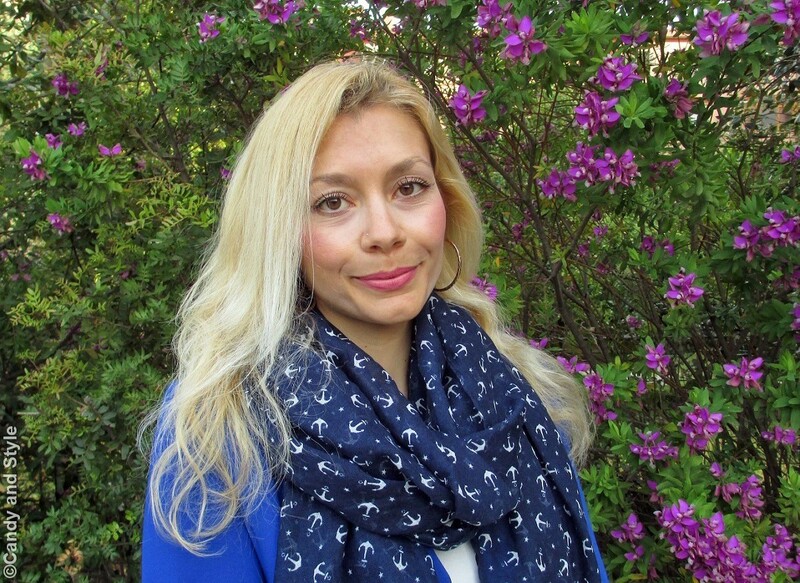 The anchor print on that scarf is so much fun and your makeup is always lovely. Have a marvelous weekend Lilli! Ciao bella Lilli, first at all, your hair looks a little bit wilder today and i really like it and you looks fresh with the touch of tan at your face. i agree wish you blue is a very confidence color and very nice for you and i think i fall in love with this pretty scarf with the anchors print. Tra i miei look preferiti di sempre Lilli, sei bellissima vestita così e poi adoro i capelli sciolti, dovresti portarli più spesso così! Bellissima poi la sciarpina con le ancore, la voglio anche io!!! I think this is the first time I see you without your signature bold red lips and I love it, Lilli! You look so sweet and just downright lovely with this shade of lipstick, your face looks fresh and radiant. I really like seeing you with joggers and it makes me want to get one for myself soon. I have yet to go shopping but probably will this weekend. Have a great weekend, Lilli! What a lovely outfit! !Like your denim joggers and your blue blazer! !The scarf is very preety with the anchors print! !Loading for Summer!!!!! il blu ti dona...mi piace moltissimo questo outfit comodo...e complimenti per un trucco sempre perfetto! We are both in Blue today. I like your jacket and anchors scarf. You definitely look so relaxed and chic! I thought red was your color, but blue is definitely a color that looks just as amazing on you! I am absolutely obsessed with your denim joggers and I love how you paired it with the royal blue blazer and printed scarf! Keep rocking those fabulous outfits Lilli! Kisses and enjoy an amazing weekend hun! 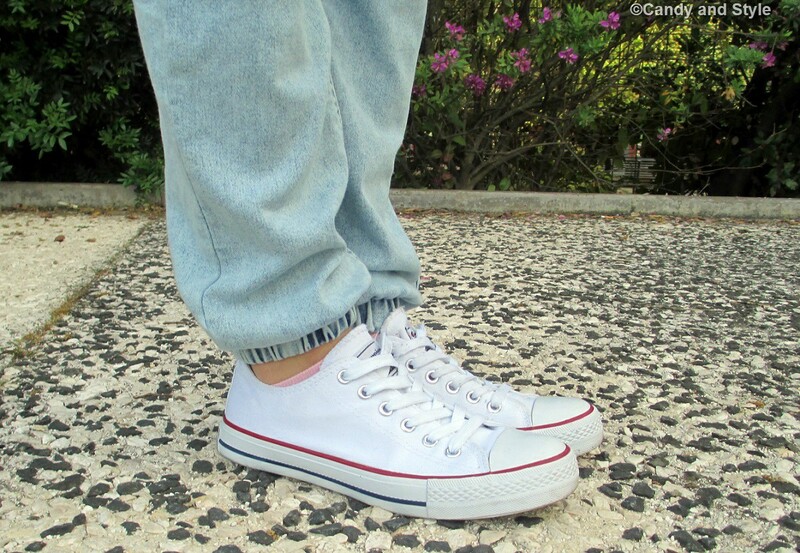 Che belli i tuoi jeans! Mi piace molto questo look, semplice e casual! and that outfit is chic too. Lilli il blu ti dona molto, il foulard è molto carino. Lilli're right! The blue color also gives me tranquility and peace, I like your pashmina with those details of anchors and blazer has also fallen in love is perfect and I remember the colors of the sea. Happy weekend dear. ciao Lilli! amo veramente tutto di questo look! ho un debole per il blu e la sciarpina mi aveva giò colpita, l'hai abbinata perfettamente! adoro il colore del blazer e tutti gli accessori! un look che ti copierei volentieri! That outfit looks so good on you Lilli! I love the mix of blues! Your hair looks gorgeous! Che bello questo blazer blu elettrico e deliziosa la pashmina! You look wonderful , casual and so cool !I love this look: the little anchors are adorable, the blazer is beautiful and with navy blue scarf it looks even more gorgeous, the black and white stripe top with black and the light denim and the super cool crossbody. Stunning look! ps: I love your hair down ! Insta April - Your April Instagrams are the cutest! Wonderful moments from your daily life, Lilli! Sporty Monday - This is a really great look :) I love the top, I’m such a sucker for anything with stripes. You look fresh and ready for a new week in great style! Spring essentials - These are so very nice, I love the colours ans the comfy snealers. I’m also all for wonderful and relaxed style in summer! Total denim - Looking quite polished in your denim on denim look Lilli! You’re the queen of mix and match! Gorgeous look. Joggers mania – I’m in love! Great selection for all occasions you`ve got here! Want a few. Bouclé and silver - you’re such a stunner babe! the jacket and shorts set is just too cute! Love it when you wear red , this is a truly amazing outfit and youir photos are stunning besides adorable! Wish you the loveliest week my dear! Che bello questo look, splendido il colore del balzer! Ooo, I just love your anchors scarf! And this blazer... the shade of blue it looks amazing on you! Your look is so cosy, so chic! Effortless beauty! Una grande abraccia per te, cara mia! Your scarf is dashing and I am loving this look as all your looks of course. Hope you had a great week Lilli and sending you big hugs and kisses. E che bello questo mix casual, ma curato e femminile! Ma che bello il blazer. e adoro il foulard che avevo già notato! I love all the mixed shades of blue Lilli, it has a very peaceful and elegant effect. And I love that pretty, natural makeup look too! Lilli ma lo sai che mi ha colpito questo outfit nella sua semplicità. Belli questi toni di blu insieme e belle le piccole ancore. Mi piace proprio tanto, trovo che questo colore ti doni particolarmente. Stai benissimo, adoro il blu della giacca , mi piace molto anche la sciarpona! Blue is so lovely on you Lilli. I love the theme happening here, all different shades of it. 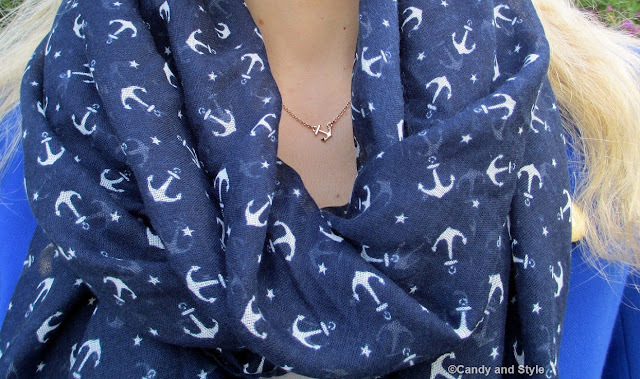 That scarf is my fave piece, mostly because of the anchors and man do I love nautical references. I think a red pout would have been fetching but so is that pale shade of pink you have on too. Happy Wednesday L, hope this week has been kind thus far. Wow I swear that scarf is really making a huge fashion statement!